Update (22 Dec 2016): The last word on this story had yet to be said. 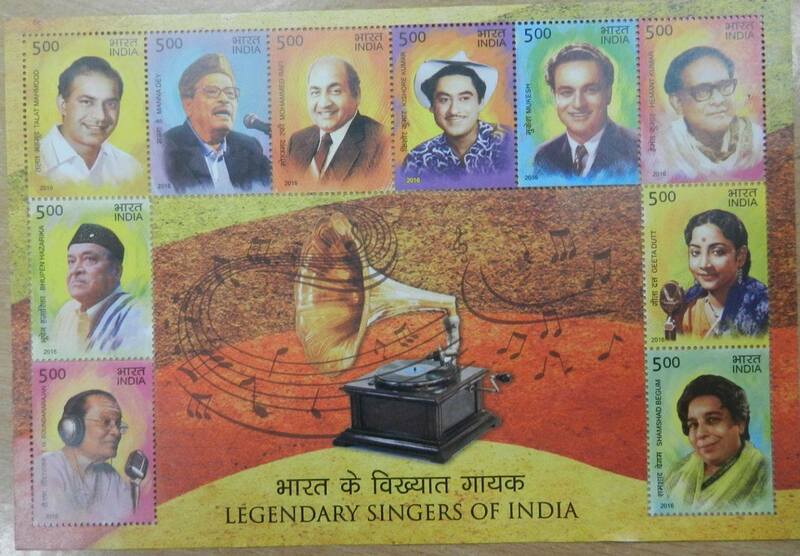 India Post will release the Legendary Singers of India stamps on 31st December 2016. Sheets of 45 stamps for each singer is being sold on ePostOffice for pre-booking. This does again raise the question about commemorating the same singers with a second stamp (six out of 10). We highly recommend that the list at the end of this post must be considered for issuing stamps on India's well known singers. 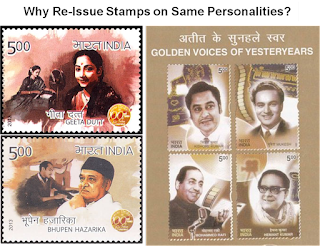 BetterPhilately had reported this on 04 April 2016 (http://betterphilately.blogspot.com/2015/10/india-post-stamp-subjects-for-2016.html), while pointing out that stamps had been previously released on 6 out of 10 (highlighted in blue) personalities selected this time around. Within a few days, some other options for famous playback singers was provided on the BetterPhilately twitter feed (https://twitter.com/BetterPhilately/status/719343350193790976). Now it has been reported on Facebook that these stamps along with the miniature sheet of 10 designs have been recalled by India Post. All philatelic centers have been asked to send the stamps back to New Delhi. What led to this adhoc decision? 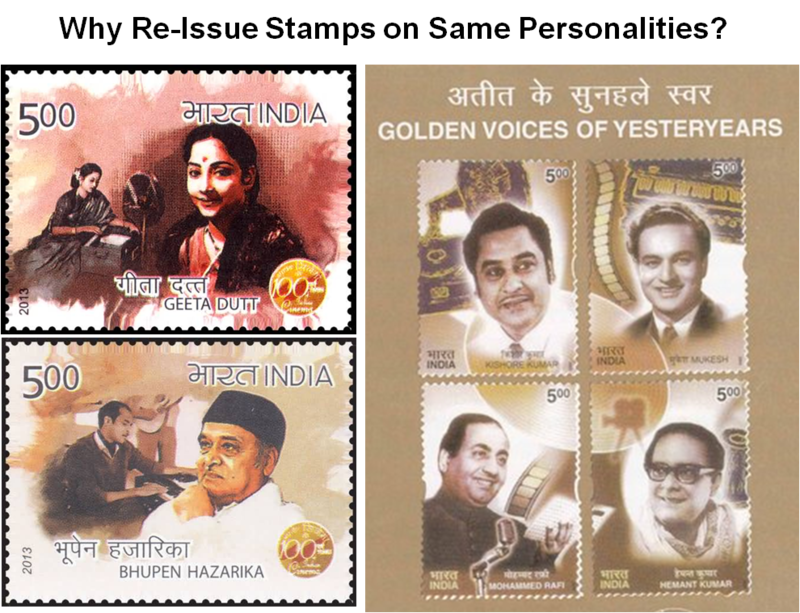 - Was there a realization in India Post that these stamps do not well represent all regions of India? - Were these postage stamps released prematurely by some philatelic offices and this recall will help identify the culprits? Returns from whichever post office do not match the quantity originally sent could be easily found. - Are there some errors in printing or logistical issues behind the release? in recent times, commemorative stamps and definitive stamps (11th series) are not supplied adequately to ahmedabad while same issues are available online on the same day at higher prices. why such commercial business? It appears that ePostOffice sells the definitive and commemorative stamp sheets at face value. Another way to ensure that one gets all stamps is to increase the quantity in the Philatelic Deposit Account with the post office. Even though it will get late in delivery, it ensures supply. Let us know if we can help. How come these stamps are available on eBay?? Our suggestion is to ignore these sellers of unreleased India Post stamps. So far, the government has not provided any information regarding the recall of the stamps. It will be best to wait and watch as this situation develops. It is likely that this set of stamps will get released this year. It is highly recommended that these stamps should be purchased only once they are released officially. Well, the question remains unanswered. I'll post it again : How is someone able to get hold of stamps which are not released by postal department? Do these people work for postal department ? It's very funny how they make mockery of Philately with these statements :) - "never to be issued..." and "Gem of an issue..."
We are unable to provide further details for this subject at this time. Let's wait and see what steps are taken to remedy this issue. Thanks for visiting the blog. Well Done India post by releasing the leaked issues officially. This should teach a lesson to those who purchased these miniature sheets of face value Rs50/- for over a thousand rupees on ebay. Let us not encourage these thieves. We could not agree more. This move by India Post is appreciable and goes to show the power of clean business practices. In the future, India Post needs to ensure that no stamps are pre-maturely issued. This will go a long way in preventing such occurrences. Thanks for the feedback. Agreed, also tells us [all collectors]not to run after withdrawn issues, as far as Philately is concerned, they have no significance. There are several more improvements required by India Post, mainly concerns over recent hike in prices of issues and exorbitant pricing of Sheetlets on ePostOffice website. Prices are exactly double or more for these items and they are available in POs at face value later point in time !! AFAIK, the entire lot of these issues is set to be destroyed. New names and designs are going to be proposed. Thanks for letting us know. Toward the end of this blog post we've listed at least 7 singers that should be considered if a new set of stamps are to be printed.